Spider-Man is the most youthful and relatable of all the superheroes in the Marvel Universe. We love him because he reminds us that one doesn’t have to be perfect to be a hero. Peter Parker may save New York from villains, but in the end, he still wants to get invited to the cool kids’ table. Spider-Man: Into the Verse changes the conversation by introducing us to a new member of the Spider-Verse. Spider-Man is about to get a new borough and become bilingual with a high top fade. And in walks Miles Morales. He’s smart, loves music, and like Peter is trying to fit in at his new school. Life at home is nurturing for Miles. His father, a police officer, isn’t afraid to be affectionate and stern. His mother, a nurse, showers him with love. He quickly switches from speaking English with his father to speaking Spanish with his mother and then Spanglish while navigating effortlessly in his neighborhood. His Latinidad is in his DNA. He is his authentic self which is perhaps the best message when it comes to his cultural identity. The only shortcoming is that Miles is not voiced by an Afro-Latino actor but by Shameik Moore (Jamaican-American). On the other hand, Rio Morales comes to life courtesy of Luna Lauren Velez who herself is Puerto Rican. 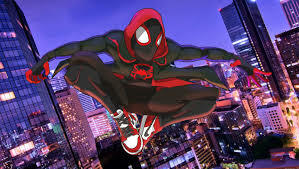 Miles is a typical teenager, and the animators did a great job in personalizing his style. It’s apparent in scenes where he’s wearing his Jordans untied, and his love for Post Malone. Miles’ humming as a relaxation mechanism is one of the most endearing moments of this movie. On the technical side, Spider-Man Into the Verse beautifully intertwines the pages of the comic book with the animation, it’s a visual novel. The hustle and bustle of New York City captured via the skyscrapers, blinking lights, and horns blasting from moving taxi cabs all are accurate depictions. Pop-ups are another beautiful element of this story; they help the viewer get into Miles headspace. The interactive artwork comes to life in the subway graffiti and when Miles draws in his notebook. As with other more recent Marvel movies, the Stan Lee cameo is an audience favorite. Miles’ Spider-Man is a hero for today’s generation. He carries tremendous responsibility yet still displays many of the imperfections of a teenager. The overall message of this Spider-Man is that anyone can rise to the occasion – even a bicultural Afro-Latino kid from Brooklyn. The casting of Duban Prado as Daniel is overlooked. Prado is the other Afro-Colombian actor in the series. He is one of the university students Carmen befriends. Knowing the above, I understood that this show wasn’t trying to make a statement but entertain. Siempre Bruja accomplishes that goal. Some of my favorite moments in the series are when Carmen is learning what an app is or her experience drinking alcohol for the first time. We root for Carmen and are excited to see her get stronger with each new challenge. This story is also about friendship. 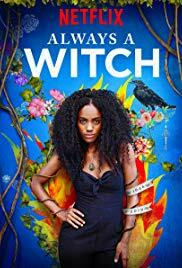 http://remezcla.com/lists/film/latino-critics-netflix-siempre-bruja-review/ In the end, her newfound friends assist her in discovering her inner strength. In an interview Angely explains that Carmen may have started as this love-sick woman wanting to save her man however once she arrived in the future and charged off on her mission, she began to find her strength. One of the reasons we are rooting for Carmen is because of Angely’s performance.